Barbie Dancing Doll Reproduction (official name "Swirl Ponytail Barbie Doll") is a 2010 release in the My Favorite Barbie Series. 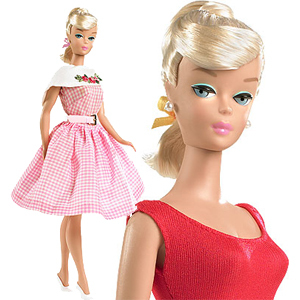 The series began in 2009 in celebration of Barbie's 50th Anniversary. 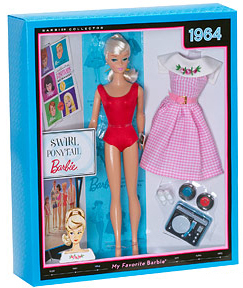 Included in the set are a reproduction Blonde 1964 Swirl Ponytail Barbie wearing her original Red Jersey Swimsuit and Dancing Doll #1626 (1965). In addition to the completely accessorized Dancing Doll Dress, the set also includes three collector cards and a reproduction Barbie Booklet. The set is in the wonderful "My Favorite Barbie" style box with the date (1964) in the upper right corner. I love these boxes because they display beautifully, but the lid lifts off so you can touch and feel the doll. The set was released in December 2009 for 2010.